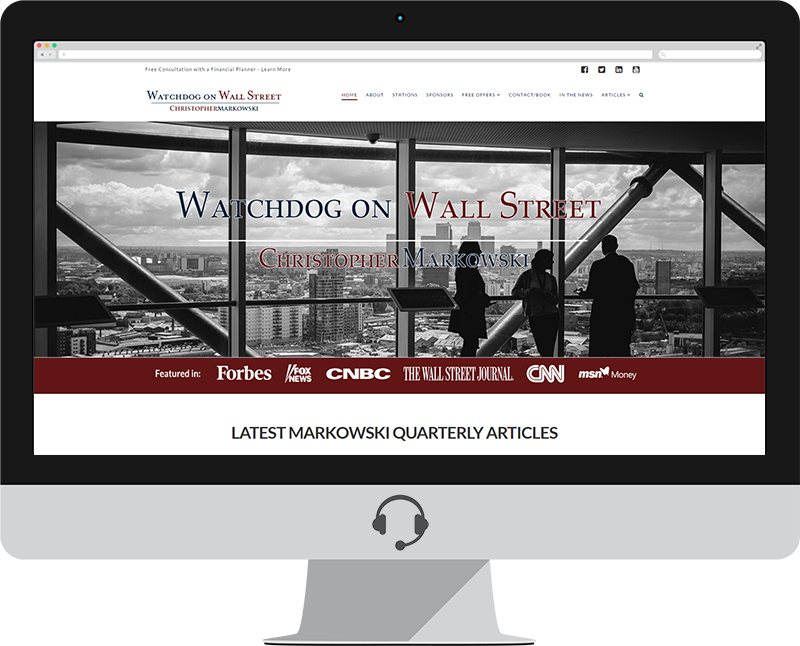 Lakewood Ranch resident Chris Markowski from Watchdog on Wall Street asked Lakewood Ranch Web Designer Social Operator to re-design his website and make it look modern and incorporate all his latest news articles, blogs and podcasts. Chris Markowski has worn many hats throughout his career so far, carrying titles such as author, radio personality, investment broker, founder, and more. Chris’s history on Wall Street started with accepting a job at an up-and-coming investment firm. Within two years, under his guidance, the firm’s sales increased by 1500% and the firm was named #2 on INC Magazine’s list of fastest growing privately held companies. However, while working and spending a significant amount of time in the same water as some of Wall Street’s most notorious “sharks,” Chris discovered how corrupt Wall Street could be. The fact that so many executives were scamming their customers and the public with no remorse was shocking to him. The respected firm that Chris helped to build had become an opportunity for insiders to get rich. It was then that Chris decided to expose countless instances of lies, greed and manipulation, bringing down the firm that he helped to build. It was then that Chris dedicated himself to making sure Americans received the truth about what was really happening behind the scenes on Wall Street. Chris has gone head to head with large brokerage houses, dot-com scams, Enron, WorldCom, the real estate bubble, and corrupt politicians. He has warned Americans about large scandals and corruptions years before they made headlines. Chris is also the editor of investor advocate newsletter, The Markowski Quarterly, which is read by thousands worldwide. He writes both The Markowski Quarterly and Personal CFO. These publications give people an inside look at Wall Street and politics. The Watchdog on Wall Street website is also update daily with news regarding Wall Street. Chris has taken his vision of honest and equality to the national airwaves with his groundbreaking radio show “The Watchdog on Wall Street” – now with over 15 years of syndication and streaming in over 100 markets. In addition to being a regular contributor to Newsmax and TheBlaze, he has made guest appearances on Fox News, CNN, and other national media outlets. Chris has also been broadcast at both Democratic and Republican National Conventions and Presidential Inaugurations.